Ingredients: 4 tablespoons (1/2 stick) butter, 2 tablespoons olive oil, 2 large onions, sliced1 boneless sirloin steak (about 2 pounds),Salt and pepper,1/2 cup bourbon. First in a skillet melt 2 tablespoons butter and add 1 tablespoon olive oil. Add sliced onions to pan and cook over medium heat around 15 minutes, onions need to be golden brown, it was a was less than 15 minutes for me. I watched the onions and stirred occasionally. Once onions were golden brown I removed from skillet. I seasoned the steak with salt, pepper and – Supreme tradition Steakhouse Seasoning. I always use this seasoning for my steaks. Once seasoned I seared the steak in the skillet, over medium heat, with the remaining tablespoon of oil. Sear for 6 minutes on each side. 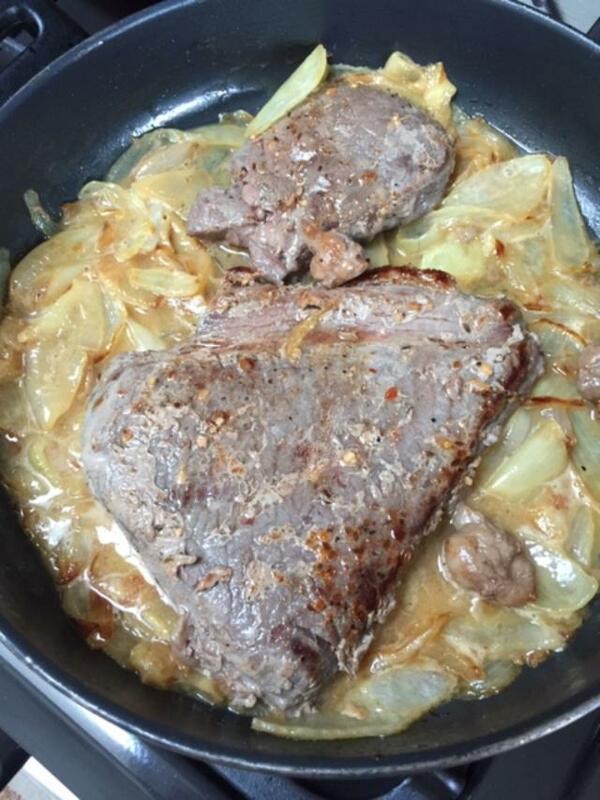 Once steak browns remove from skillet. Then add the 1/2 cup of bourbon to skillet and scrape around what is in pan. Allow the liquid to simmer, about a minute. Liquid should be reduced by 1/2. I watched this process carefully for I did not want the liquid to be reduced more than necessary. Once liquid is reduced add onions to pan along with the remaining 2 tablespoons of butter. Once butter melts reduce the heat and simmer gently, do keep stirring and checking the liquid, remember you don’t want it evaporated. After about 2 minutes, could be less, add the steak to skillet. When my husband came home and lifted the cover of the skillet, always checking on his dinner, he made me 🙂 when he said,” Wow, this meal smells good.” Guess what? It also tasted good!